Over the past few years, multiple studies have shown shifts in the landscape surrounding LGBTQ topics. The overall acceptance toward LGBTQ people in the US has risen in the last 10 years—in 2016, 63% of Americans said they think homosexuality should be accepted by society, compared to only 51% in 2006. Glaad’s Accelerating Acceptance poll in released in March 2017 shows that 20% of Millennials (people aged 18-34) identify as LGBTQ—more than twice as many as the Boomer generation (people aged 52-71). 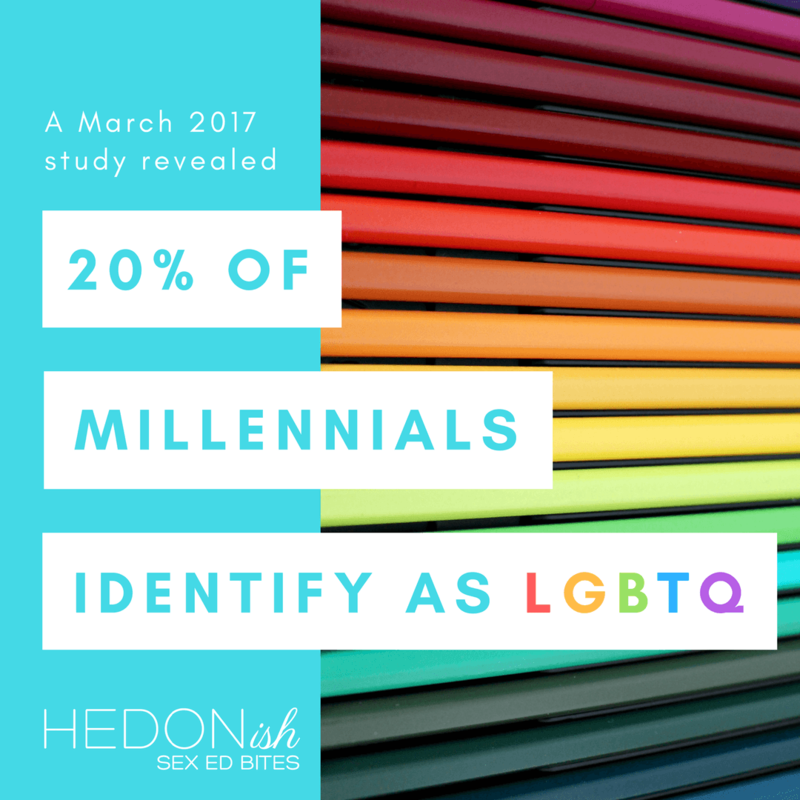 Although a Gallup survey from January 2017 showed that the number of Millennials who identify as LGBTQ is closer to 7.3%, what is clear is that there has been an increase in the overall number of Americans that identify as LGBTQ from 8.3 million Americans (3.5% of the adult population) in 2012 to 10 million (4.1%) in 2016. The way people identify or label their sexuality has also changed, and younger generations are increasingly less likely to identify with binary terms like man/woman or gay/straight, which Glaad attributes to “increased cultural acceptance and media visibility that oftentimes allows for an earlier and more sophisticated understanding of sexual orientation and gender identity as spectrums.” Research from Ditch the Label, a UK-based anti-bullying nonprofit, shows that among people aged 13-26, labels like “straight” “bisexual” “lesbian” and “gay” are becoming increasingly obsolete. In fact, 34% of the 1000 young people surveyed didn’t identify as any of those labels, and 70% of the people surveyed said sexuality labels are no longer important. Despite the growing acceptance of LGBTQ people and the increasing number of people who identify as something other than “straight,” there are still major issues to be addressed and work to be done. Many don’t realize that there’s no nation-wide law that protects gender and sexual minorities from discrimination, and only 28 states have laws against employment discrimination based on sexual orientation for public employees. LGBTQ youth also face many challenges, including that they are almost five times as likely to attempt suicide than heterosexual youth. Data from the Human Rights Campaign shows that LGBTQ youth are twice as like to be physically assaulted, kick, or shoved at, and 42% don’t feel their communities are accepting of LGBTQ people. Transgender individuals especially face an overwhelming amount of violence. From 2010 to 2016 at least 111 transgender or gender non-binary people were murdered, and nearly 75% of those murders were of black trans women and non-binary femmes. Violence against transgender individuals accounted for 67% of the hate-related homicides against LGBTQ people in 2015, according to the National Coalition of Anti-Violence Programs, and as of September 2017, 21 transgender people have been killed in 2017 alone.